His Royal Highness Prince Andrew, the Duke of York, is to officially open the Pacific Games in Port Moresby in July, Prime Minister, Peter O'Neill, announced. O'Neill said he was delighted Prince Andrew had accepted his invitation to visit Papua New Guinea and officially open the Games. "When Papua New Guinea last hosted the Games, in 1991, Prince Andrew officially opened what was then known as the South Pacific Games." "It is a measure of the standing the Games enjoys that His Royal Highness has agreed to officially open the event in a few weeks time," he said. O'Neill said he was certain competitors from across the Pacific, as well as the people of Papua New Guinea, would accord His Royal Highness a warm welcome. 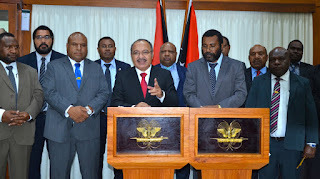 Prime Minister Peter O'Neill has welcomed the decision by the Speaker of Parliament and Member for Finschafen Theodore Zurenuoc MP, and Member for Kundiawa-Gembogl, Tobias Kulang MP, to join the People's National Congress Party. 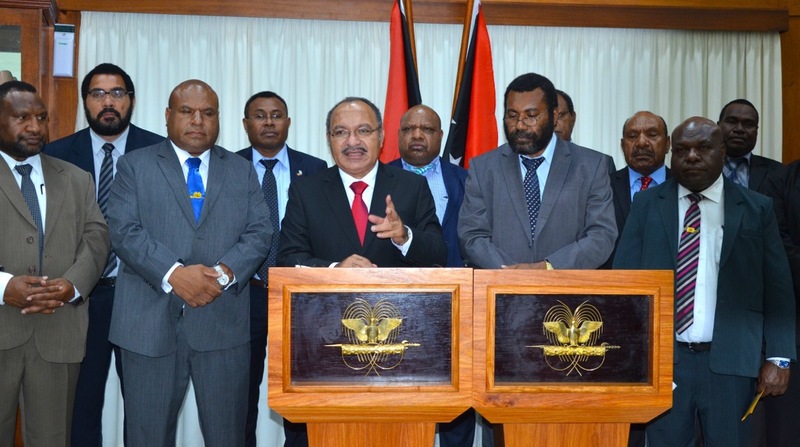 O'Neill made the announcement at a press conference at the National Parliament yesterday. The Prime Minister welcomed the members saying that the party continues to grow because of the stability that it is providing to the nation. "Stability in terms of leadership, stability in terms of policy and stability in the management of the affairs of the economy of the country is bringing members to the PNC Party," O'Neill said. "Working with the speaker over the last two and a half years of the parliament and working with our brother member, Tobias Kulang, we have come to recognize that we need to put our talents and abilities together for the good of the country. "Them joining of Government adds further stability so that we can continue to roll out the programs that they have started. "The talent and experience that the two gentlemen will bring to the party will contribute further in making sure that we strengthen the party's ability so that we can deliver more to our people throughout the country." The Prime Ministers said the Government has very innovative policies like free education and healthcare for which credit should also be shared with Zurenuoc. "Many people might not know that free education is the brainchild of the Speaker when he was Education Minister, so now he has come to the core of the party where we are implementing that policy." The Prime Minister further highlighted the professionalism and independence of Theodore Zurenuoc in carrying out his duties as the Speaker of the Parliament. "Many of you know how Parliaments in the past were managed, now we know things are functioning and Parliamentary business is being conducted. "We have not missed one day of Parliamentary meetings since this parliament started. This is a credit to the speaker." The Prime Minister thanked the People's Progress Party for their understanding and respecting the Members' decisions. Prime Minister Peter O'Neill said strengthening human resources in Papua New Guinea is one of the most important challenges faced today and everyone in the country needs to play a part. He made the comments yesterday while awards to leading Papua New Guinean organisations that have made an outstanding contribution to developing the human resource capacity of the nation. 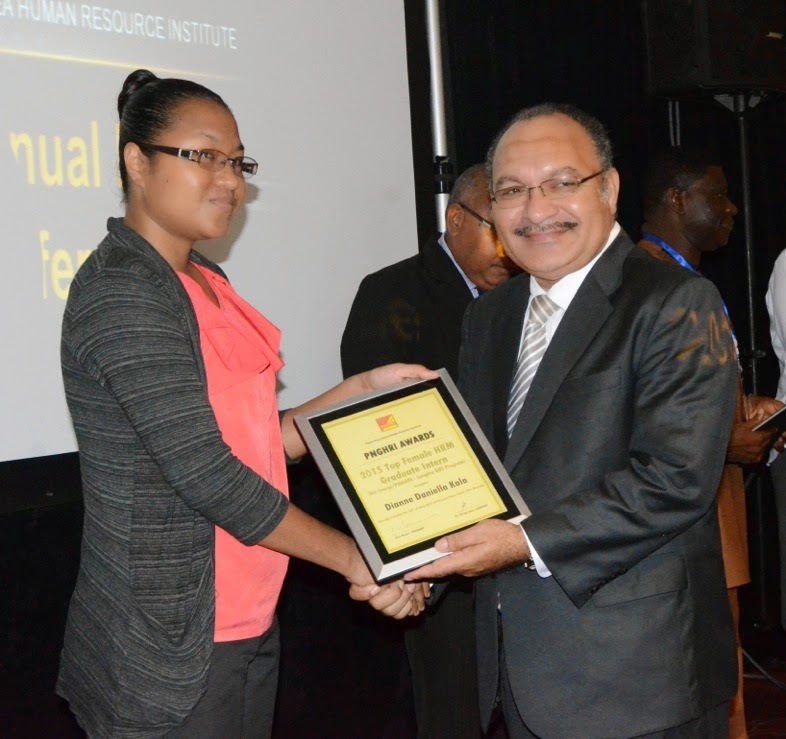 The awards were presented on the opening day of the 2015 Papua New Guinea Human Resource Institute (PNGHRI) National Congress in Port Moresby. "Our nation in a period of true transition and it is absolutely vital we get this transition right," O'Neill said. "As a community, and as a country, we need everyone to do his or her part in making sure that we develop our country to have a better standard of living. "Our Government is focusing on ensuring the transition we are going through today is going to deliver real benefits to Papua New Guineans, especially for our children into the future. "This human resources conference is very important in ensuring our country takes a strategic approach in strengthening the human resources capacity. "I am looking forward to receiving the outcomes of your deliberations." The Prime Minister said education was central to fully develop human resources in Papua New Guinea. "One thing I want our people to remember is that this government is all about educating people in our country through investment in students, teachers and infrastructure. "As an example, with new infrastructure we are able to increase the intake at the University of Papua New Guinea. This is due in part to the increase in student accommodation when we hand over the Games Village to the university. "The Government will continue to invest in the learning facilities in our country, and we are naming these institutions in the budget so that money goes direct to these schools. "The funding of education, like many core government services, can be delivered at a local level where needs can be properly assessed and funds delivered direct. "Our Government is ensuing that for the first time there is a transition of funds that are going directly to the districts and to the local communities. "We are funding Local Level Government authorities this year with K100,000 and next year this will again increase to K500,000. "This is for every LLG in the country, and we are funding every district through funding that has never been there before. "I urge people to go to the remote areas and see that this funding is being fully used." 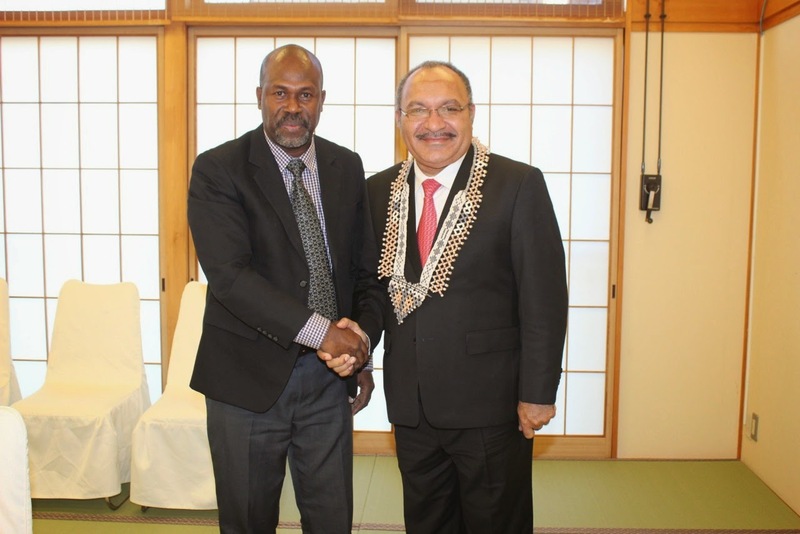 Prime Minister Peter O'Neill held a series of bilateral meetings with regional Leaders as part of the 7th Pacific Islands Leaders Meeting (PALM 7) in Iwaki City, Fukushima, Japan. Major multilateral conferences provide opportunities to speak informally with Leaders from our partner countries, while also taking enabling formal bilateral meetings with as many Leaders as time permits. The Prime Minister held formal bilateral meetings in Iwaki City with the Leaders of the delegations from Samoa, Vanuatu, the Solomon Islands and Australia, that provided an opportunity to discuss matters of joint significance. 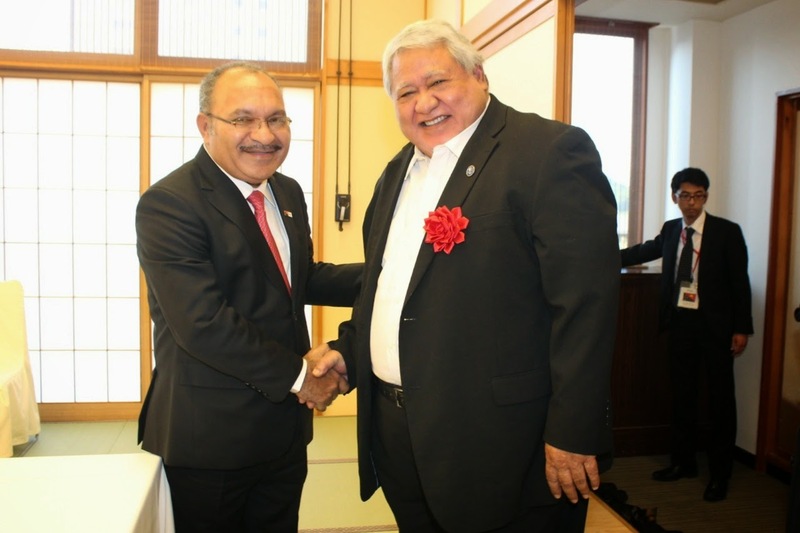 O'Neill met with the Prime Minister of Samoa, Tuilaepa Sailele Malielegaoi, and advised his long-serving counterpart of Papua New Guinea's desire to present him with the nation's highest award. "I informed Prime Minister Malielegaoi that the Government of Papua New Guinea would like to bestow upon him a Logohu Award," Prime Minister O'Neill said. 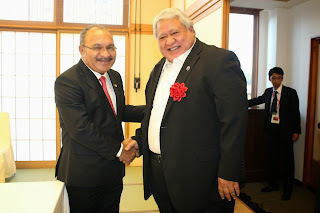 "As the senior statesman of the Pacific island countries, Prime Minister Malielegaoi has been instrumental in advancing regional development and cooperation, and facilitating warm relations between countries. "We look forward to the Logohu Award being presented to Prime Minister Malielegaoi when he visits Port Moresby in September for the Pacific Islands Forum Leaders' Meeting." The Prime Ministers further discussed Papua New Guinea investments in Samoa and plans for the Bank of South Pacific to expand its operations to Samoa. In the meeting between O'Neill and the Prime Minister of Vanuatu, Joseph Natuman, the leaders discussed disaster relief following Cyclone Pam in April this year. "It was important to have Prime Minister Natuman's personal perspective of ongoing efforts to recover from the damage caused by Cyclone Pam," O'Neill said. "The disaster support provided by Papua New Guinea has been well received and is being used to help people in Vanuatu to rebuild their lives." The Prime Ministers further discussed the possibility of expanding air links through an air services agreement that would further facilitate trade and investment between the two countries. Prime Minister Natuman also advised that Vanuatu university students would be coming to study in Papua New Guinea from the first semester for 2016 as part of the Memorandum of Understanding that was recently signed between the two countries. O'Neill reaffirmed Papua New Guinea's commitment to the Solomon Islands in his meeting with Deputy Prime Minister, Douglas Ete, highlighting the ongoing development support arrangement that is in place. "The Solomon Islands is a very important friend of Papua New Guinea and we are providing development support to improve lives," the Prime Minister said. "We have in place a 100 million Kina development corporation assistance program that we are delivering over five years. "This was formalised in 2012 and we will present the next tranche of this support when we attend the MSG meeting in Honiara in June." The leaders also discussed the Melanesian submarine telecommunications cable and the advantages this will bring to the broader region. The final formal bilateral meeting for the Prime Minister was with the Australia's Foreign Minister, Julie Bishop, which covered a number of issues of concern including the proposal for a consular office in Buka, the Manus Regional Processing Centre and visa issues. Also attended by the Papua New Guinea's Foreign Minister, Rimbink Pato, the meeting provided an opportunity to reach common ground on some outstanding issues. "We accept that there was a misunderstanding and communications processes were not followed in relation to the foreign consulate proposal. "I will leave it to Australia to make a formal announcement on their views and we look forward to moving on. "With the Manus centre we are seeing the number of asylum seekers reduce as many return to their home countries. "Those who are approved and deemed to be legitimate refugees, and want to make a contribution and apply their skills in our community, will have the opportunity to stay." The Prime Minister has called for progress to be made in coming to a shared position on facilitating easier visa access for Papua New Guineans seeking to visit Australia. "This visa issues as been complicated for several reasons, but we now need to move to a resolution whereby travel for Papua New Guineans and Australians between our countries is simplified." This issues is anticipated to be raised at an upcoming ministerial level meeting between Papua Guinea and Australia in Port Moresby in June. The Prime Minister earlier held bilateral meetings with the President of Palau, Thomas Remengesu Jr, and Japan's Prime Minister, Shinzo Abe, earlier in Tokyo. MTS owners of the Madang resort and Kalibobo Village are offering special packages to see the Madang Festival over the Queens Birthday Weekend to coincide with the spectacular Madang Festival. The packages offered start at just K699 per person from Port Moresby and K499 from Lae and Wewak, they include return airfares on Travel Air, three nights accommodation in budget rooms at the beautiful Madang Resort, buffet breakfasts, transfers, airport transfers and tickets to see the Madang Festival which promises to be one of the largest festivals in PNG with more than 40 sing sing groups, 20 bamboo bands, sporting events, canoe races and novelty events. MTS executive Alex Paira said that the packages are made possible in conjunction with the cooperation of the Madang Resort and Travel Air which are expected to attract many residents in PNG to visit beautiful Madang and an affordable rate. Mr Paira said that there is only limited space. Those interested in bookings should not hesitate and book immediately and take advantage of the special rates. Apart from witnessing the Madang Festival, the Madang Resort is offering free use of Kayaks, sailing catamarans, tennis and sightseeing tours are available upon request. Travel Air Depart Port Moresby on Friday afternoon and return to Port Moresby and Wewak on Monday. There are special conditions which are available upon request and bookings can be made on line madangresort.com or email info@madangresort.com Tel 4241300 indicating Madang Festival Package. 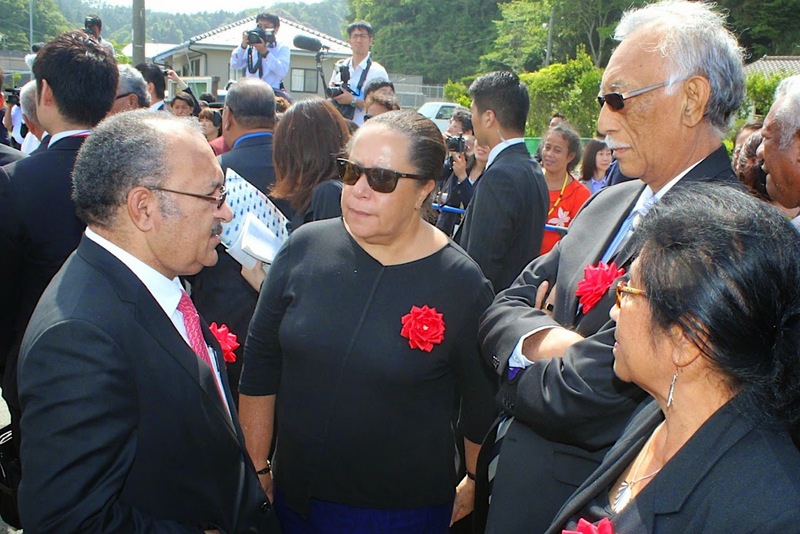 Prime Minister Peter O'Neill has joined fellow Pacific Leaders in commemorating the tragic loss of life that occurred following the Japan's East Coast Tsunami in 2011. The commemoration was led by Japan's Prime Minister, Shinzo Abe, near Iwaki in Fukushima Prefecture, as part of the 7th Pacific Islands Leaders Meeting (PALM 7) being held in Japan. O'Neill made special note of the resilience of the survivors in the town, and said they share a special bond with survivors of the Aitape Tsunami that occurred in Papua New Guinea 1998. "Our thoughts and condolences go to the families who lost loved ones in the tsunami, and to the survivors who suffered as a result of the disaster," the Prime Minister said at one of the locations where the tsunami struck in Japan. "While we can see the aftermath of the tsunami and the destruction that it leaves behind. "Only those people who experienced a tsunami can fully understand the power and the horror of the waves as they destroyed this town in Japan and villages up and down the coast from Sissano Lagoon in Papua New Guinea. "We remember the lives lost and the lives ruined by these terrible events." O'Neill said lessons have to be learned from disasters such as tsunamis, this includes clear planning and strategies implemented to preserve life and property. "We cannot stop tsunamis but we can work together to develop ways to reduce their impact on communities. "New technologies are making it easier to ensure that people can receive tsunami warnings and take action. "People in places that are at-risk need to be ready to act at a moment's notice when a tsunami warning is issued. 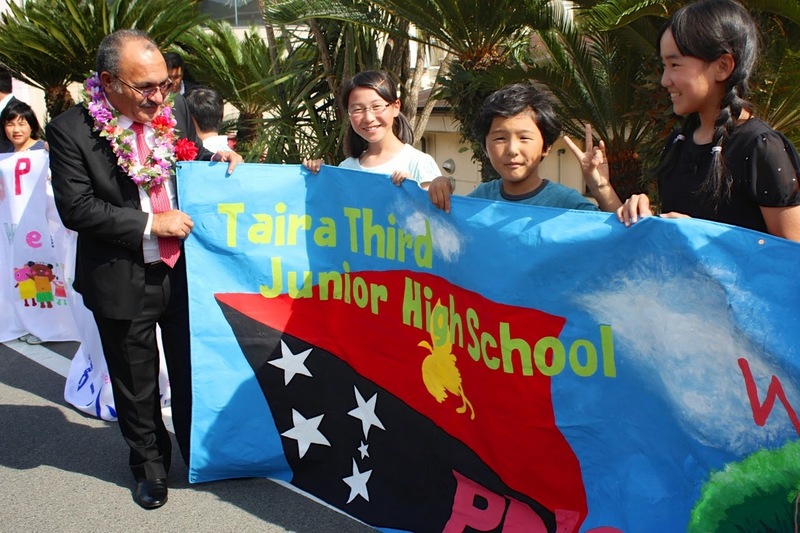 "Public education is essential in saving lives in these disasters and Papua New Guinea supports Japan's proposal to have an annual United Nations Tsunami Awareness Day." Floral wreaths were laid at the disaster area that is now undergoing extensive rehabilitation and defences established to protect against future tsunamis. 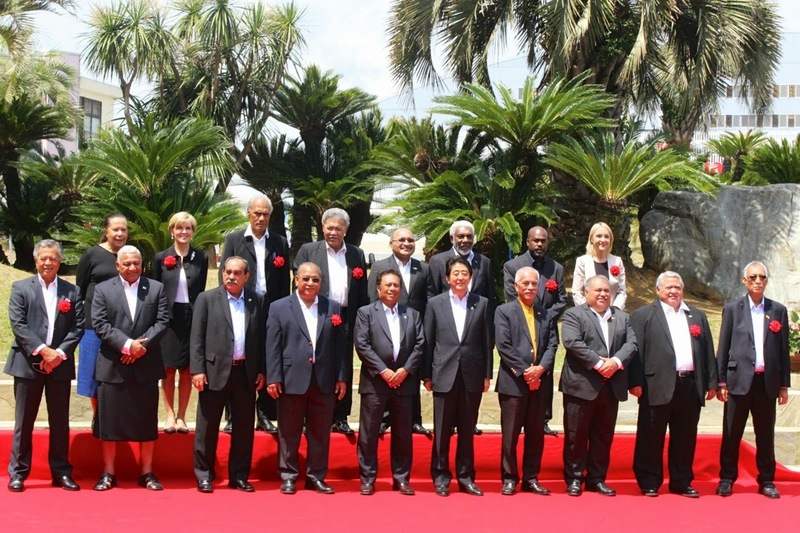 PALM 7 was hosted by Prime Minister Abe and the President of Palau, Thomas Remengesu Jr, in Iwaki on 22-23 May 2015. 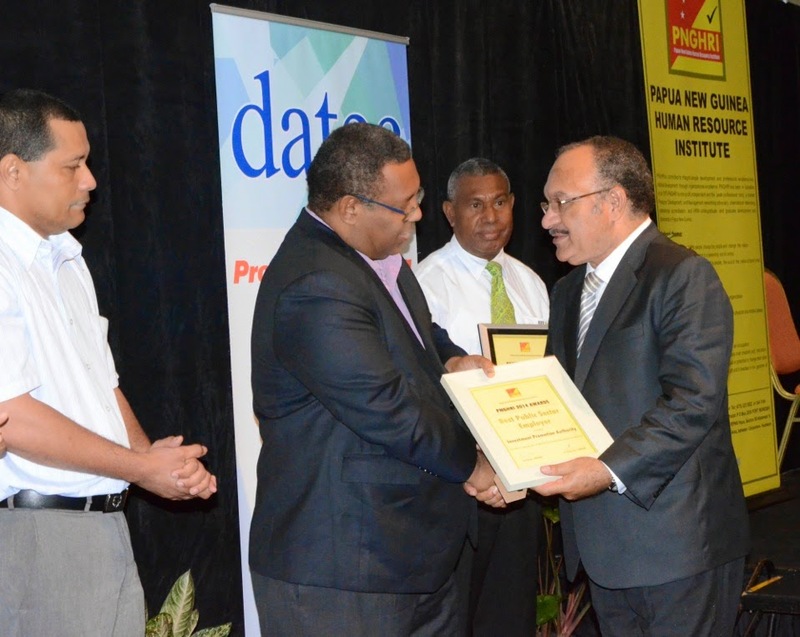 Prime Minister Peter O'Neill has highlighted the importance of tailoring approaches to the implementation of development programs to work in local circumstances. 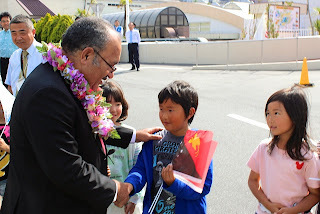 O'Neill made the comments in his first intervention at the Plenary Session of the 7th Pacific Islands Leaders Meeting (PALM 7) that is taking place in Iwaki, Fukushima Prefecture, Japan. The first session of PALM7 highlighted approaches by countries to facilitate development in their context, and utilising multilateral forums to advance initiatives around the region. Development in our region is guided by sustainable principles and approaches that should be determined by our individual and collective responsibility. The region recognises the changing global circumstances that highlight the fragility of the global ecosystem and the additional value it places on the environment, climate security, and food and water security. Our region has the greatest potential, but we are also faced by some of the most significant challenges in the world today. The SIDS Accelerated Modalities of Action SAMOA Pathway expresses those challenges and priorities. We are grateful for the Government of Japan's action to extend support in the Pacific Region to encourage sustainable development. The region's particular vulnerabilities and strengths are noted in the Sustainable Development Goals and post 2015 Development Agenda. Too often there is a problem with the definitions used to set development targets. As an example, the Millennium Development Goals should not be seen as a one-size-fits-all approach. While Papua New Guinea continues to have challenges in meeting the MDGs as defined in the global criteria – but we are seeing real development in our country through the implementation of core development priorities. These are in education, healthcare, security and infrastructure. By providing free education for all children we have been able to increase access to education from just over one million children to nearly two million children in the last three years. We are extending universal healthcare throughout our country, which has very remote areas, that are challenging to reach. We have placed a priority on increasing spending on security, the judiciary and corrective services. We are also building the infrastructure that our people and our SMEs need to trade and to travel. These are the important elements in the development of our country, and in any country. In the facilitation of development in any country, again, there is no-one-size-fits-all approach to development. I also want to take this time to acknowledge the Government of Japan for the pilot initiative on the Pacific Environment Community (PEC) Fund which addresses key environmental issues and the effects of climate change in the region. This will indeed bring positive change to the lives of our people. There is need to progress this pilot initiative, and I call for the Government of Japan to continue to support the PEC Fund and replicate it across the region, particularly those most affected. We applaud regional programs in dealing with the causes and effects of climate change in our region. We welcome Japan's Green Climate Fund and the fund that has been announced today. This will help countries in our region improve energy efficiencies – particularly renewable energy sources. NB: The conference is co-Chaired by the Prime Minister of Japan, Hon Shinzo Abe, and current Chair of the Pacific Islands Forum, the President of Palau, Hon Thomas Remengesu Jr.
Prime Minister of Papua New Guinea Peter O'Neill has undertaken a range of high level government bilateral meetings and business consultations in Tokyo prior to the 7th Pacific Islands Leaders Meeting (PALM 7) that begins I today in Japan. Meetings with the leaders of Palau and Japan provided an opportunity to discuss significant bilateral issues, and with leading Japanese businesses the Prime Minister was provided insight to business and investment opportunities in PNG. The first bilateral meeting of the visit was with the President of Palau, Thomas Remengesu Jr, where the two leaders discussed Pacific Islands Forum policy issues as Palau prepares to pass Forum Chair responsibilities to PNG. "President Remengesu has provided clear leadership to the Forum policy agenda and I commend him for his work particularly in the area of marine conservation," the Prime Minister said. "We look forward to Palau's attendance at both the Pacific Islands Forum Meeting in September, as well as 50 athletes coming for the Pacific Games in July." Meeting with Japan's Prime Minister, Shinzo Abe, over a working lunch, PM O'Neill said a number of issues were discussed that were of significant importance to both countries. "In the areas of tourism, fisheries, development and disaster preparedness, our two countries have shared interests," PM O'Neill said. "These are matters that will continue to evolve through discussions between our officials, and we expect to reach new agreements at our next meeting. "Following Prime Minister Abe's visit to Papua New Guinea last year, he has invited me to return to Japan for a State Visit later this year. "This will also provide an opportunity to bring a large number of Papua New Guinean businessmen and businesswomen to Japan to build on our established commerce and investment ties." The commerce and investment opportunities in Papua New Guinea were also the subject of discussion with business representatives from companies that included JX Nippon Oil and Sojitz Corporation, Marubeni Corporation. "There is already a lot of Japanese business interest Papua New Guinea and we want to expand that base. "Japanese investment in our country continues to grow and this is employing more and more Papua New Guineans. 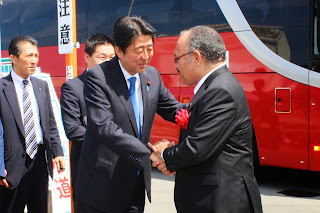 "There is also increased opportunity for Papua New Guinea exports to Japan. As one of the strongest economies in the world, Japan is an important market for Papua New Guinea that we will continue to grow." The first formal day of the PALM 7 Leaders Summit begins today. 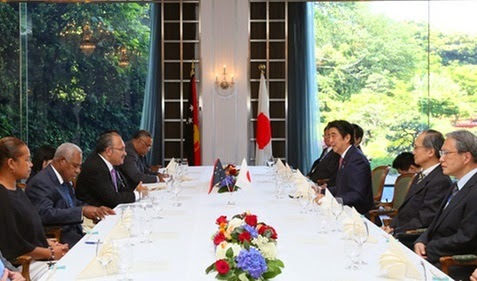 Trade and cultural exchange between Papua New Guinea and Japan will continue to strengthen through the advancement of issues discussed by the Prime Ministers of the two countries at a meeting in Tokyo yesterday. 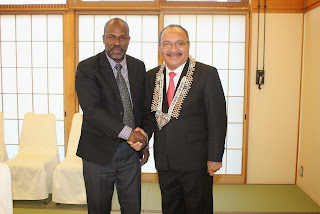 Prime Minister Peter O'Neill and his Japanese counterpart, Shinzo Abe, met on the eve of the 7th Pacific Islands Leaders Meeting (PALM7) Summit in Japan. During the working lunch the Prime Ministers discussed issues that included tourism, fisheries cooperation, development projects and tsunami awareness. 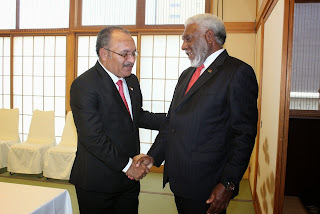 "It was a pleasure to meet with my honourable friend, Prime Minister Shizo Abe, as he prepares to host the very important PALM 7 Summit," PM O'Neill said. "Papua New Guinea and Japan have a very rich partnership that creates opportunity for trade and investment, and also tourism. "We are looking to create new opportunities for Japanese people to visit Papua New Guinea for leisure and historical visits. "Papua New Guinea is the final resting place for many Japanese war dead. While this part of our shared history began in a terrible war, as countries that are at peace, we extend the courtesy for relatives of to pay homage to their loved ones and ancestors. "With Prime Minster Abe we have discussed establishing further memorials at important locations in Papua New Guinea. "In relation to broader tourism activities, we are discussing work for the upgrade and expansion of Tokoak airport. We hope this would lead to the possibility of direct flights from Japan to Rabaul. "This is a perfect tourism destination of Japanese people looking to enjoy relaxing holidays on our beaches and experiencing our culture." 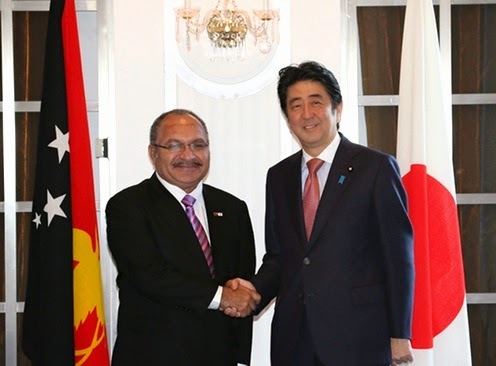 The Prime Minister said Japan and Papua New Guinea have agreed to further cooperation in the fisheries sector. "Japan has tremendous opportunity for our fisheries sector and we are looking at options to improve this trade for the good of both countries. "There are regional considerations we have to take into account in relation to fisheries and marine resources, so this is an ongoing discussion we will have with Japan as well as other island nations." Japan has again pledged its support to development projects in Papua New Guinea that are helping to rebuild infrastructure and facilitate cultural engagement with Japan. "I took the opportunity to express our appreciation to Japan for a range of projects that include national road improvements, agricultural capacity building and programs to deal with the affects climate change. "Japan is providing 27 billion Yen (K600 million) to support ongoing infrastructure projects that include rebuilding work to increase the capacity of Nadzab Airport. "A further 300 million Yen (K6.5 million) is being provided by Japan to assist in disaster management and preparation in Papua New Guinea. "Japan has also allocated US$1.5 billion to the Green Climate Fund and is encouraging Papua New Guinea and other Pacific Island nations to utilise this facility in dealing with climate change." During the meeting, Prime Minister Abe expressed his satisfaction with his State Visit to Papua New Guinea in 2014, and has invited Prime Minister O'Neill to undertake a State Visit to Japan where ongoing issues can be achieved and agreements reached. 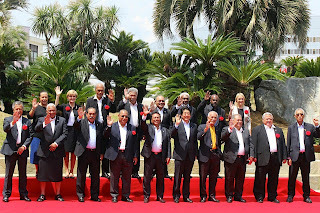 The Prime Ministers discussed the possibility of holding the first Joint Committee meeting under the Japan-Papua New Guinea investment treaty as part of the program for this visit. In their discussion, Prime Minister O'Neill also pledged Papua New Guinea's support for Japan's proposal to establish an annual United Nations World Tsunami Day. "Papua New Guinea fully supports the establishment of a United Nations World Tsunami Day on 25 November each year. "This day would raise awareness amongst at-risk communities to prepare for the possibility of a tsunami and this will save lives. "This day would also provide an opportunity to commemorate the lives lost to tsunami's in Japan, Papua New Guinea and right around the world." The PALM 7 Leaders Summit will begin in Iwaki-city, Fukushima prefecture, today and conclude on 23 May. 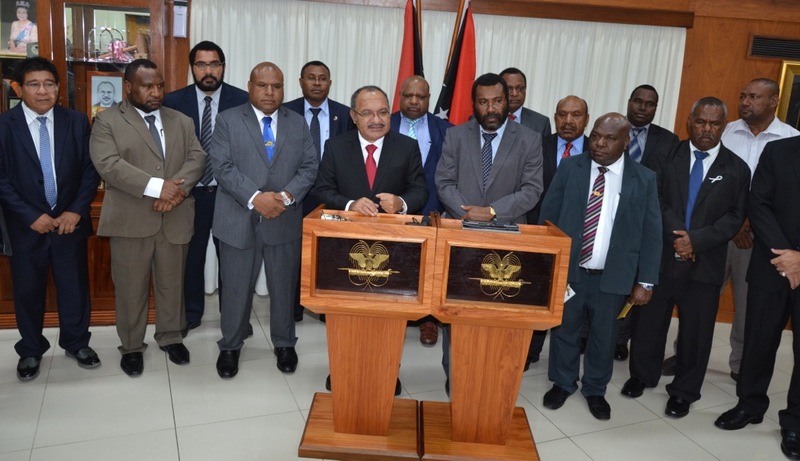 Prime Minister of Papua New Guinea Peter O'Neill has expressed satisfaction with the outcome of meetings that that took place with the President of Indonesia, Joko Widodo, during his State Visit on 11-12 May. During the two days of meetings, PNG and Indonesia discussed a range of issues that include increasing cross border cooperation for energy production and crime prevention, and deeper engagement in multilateral forums including the Melanesian Spearhead Group (MSG). "We have agreed to provide Papua New Guinea's support for Indonesia having associate membership of the Melanesian Spearhead Group, which Papua New Guinea will gladly endorse and pursue with the other leaders of the Melanesian group. "This will enable the five Melanesian provinces in Indonesia to participate in cultural, trade and investment engagement between our Melanesian countries and communities within the region. "This will also enable Melanesian people to participate in sporting events and other activities of cultural significance. "We will further strengthen our own relationship with Melanesians of which 11 million are on the Indonesian side of our border. "I again salute the President for his courage in ensuring that we take a step forward in the relationship on how we engage with the Melanesians in the Indonesian provinces. "This is truly a unique understanding that has been reached between the two Governments." Prime Minister O'Neill said there will be a further enhancement of cross-border trade that ranges from grassroots commerce and SME exchange, through to major utilities trade. "We agreed to strengthen economic opportunities along the border region where Indonesia is investing in infrastructure that we would like to have access. "This includes telecommunications, power generation and the road infrastructure that is being built and has a waiting market in Papua New Guinea." The Prime Minister further highlighted engagement between the two countries in other multilateral forums. This includes APEC where he said Indonesia was Papua New Guinea's biggest supporter in securing the opportunity to host APEC in 2018, and in ASEAN where Papua New Guinea has Special Observer status. "Indonesia is also our number one supporter in our engagement in the ASEAN countries and the ASEAN region, and for this we are grateful." The two countries also signed an MOU on Co-operation in Preventing and Combating Transnational Crime, and an MOU on Co-operation in the Field of Human Resource Development in Petroleum and Energy. 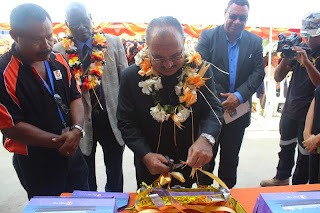 Prime Minister Peter O'Neill has launched the Divine Word University's online programmes as well as officially opening a new academic building and the Alessandro Clinic at the Madang campus on Saturday. The Prime Minister congratulated DWU for its online programme initiative, which he said would contribute and further enhance the delivery of education in Papua New Guinea. "Education must be at the forefront of embracing technology and this is what Diving Word University is doing. "Online programs will open up new opportunities for more students to study. "Through education we can change the country and Divine Word is leading the charge." 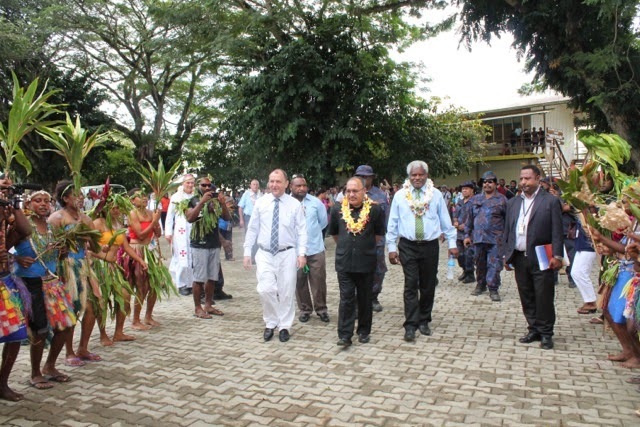 In his address to students, faculty and people from Madang, the Prime Minister stressed the importance of education as a top priority for the government since coming to office. "Each year our government spends more than 3 billion Kina on education alone. "This is the most substantial investment in education in our history. "Free education is not a new concept, it has been there since independence but no government has made a serious attempt in delivering the program for our children. "It is the right for every child in this country to be educated and the only way is to make means available." "If school fee is a problem then the government must take the problem away so we can get children into school." The Prime Minister further highlighted the introduction of the 'tuition loan program' for students at tertiary institutions that comes into effect in 2016 academic year. "Already K200 million has been made available for the tuition loan program to ease the burden of many parents who have difficulties in sending their children to university. "Similar programs are well established in Australia and many developed nations and have proven to be a success." "This programme provides the opportunity to ensure you have funding and access to better education opportunities." The programme works by students taking a loan to complete their tertiary education, then over their working life repay the loan gradually without interest. PM O'Neill reiterated that education is the key in building human resources in Papua New Guinea and a way forward for the country to achieve its millennium goals. Accompanied by the Minister for Finance, James Marape and the Minister for Higher Education, Malakai Tarbar, the Prime Minister opened the new academic building, Alessandro Clinic and new staff houses at the campus. Prime Minister Peter O'Neill has thanked members of the public for welcoming delegates from around the Asia-Pacific who attended the series of APEC meetings that took place in Port Moresby over the past week. The Prime Minister further highlighted the relevance of APEC's work at the local level in Papua New Guinea. As Papua New Guinea prepares to host the broader APEC process in 2018, PM O'Neill said the lead-in meetings provide the opportunity for the public to gain greater insight to APEC and for officials to refine logistics processes. "The early APEC meetings give the public an opportunity for many people to get a better understanding of unique processes involved in hosting APEC meetings," the Prime Minister said at the conclusion of this week's meetings. "There was also a great deal of interaction between delegates with business owners and the public, particularly relating to the meetings on women and the economy. "Business relationships have been formed this week that will continue and stimulate further economic interaction. "Through these meetings we also have the chance to refine logistical processes and enhance the capacity of officials who will interact with thousands of delegates before the end of 2018. "Support to APEC meetings will continue to evolve and extensive training undertaken as we build the significant logistical and security operation that will be in place for 2018." The Prime Minister said the benefits to the nation of hosting APEC are gained at a local level and this was demonstrated during the meetings in Port Moresby last week. "While most media the attention is focused on the high level APEC events such as the Leaders' Summit, APEC is very much a working level process that gives our country access to knowledge, skills and technical expertise from around the Asia-Pacific. "In a broad range of areas that includes agriculture, tourism, telecommunications and forestry, engaging through APEC gives Papua New Guinea direct access to information on practices that have worked in other countries. "We can then apply that adapt and apply that knowledge in our economy. "Papua New Guinea has been stepping up policy and technical engagement in APEC over the past few years and is now playing a more active role in the APEC process than ever before." The two meetings that were held in Port Moresby over the past week were the Policy Partnership on Women and the Economy followed by the APEC High Level Policy Dialogue on Human Capacity Building. The next round of APEC meetings will take place in the Philippines when senior officials meet ahead of the meeting of Trade Ministers on 23-24 May. 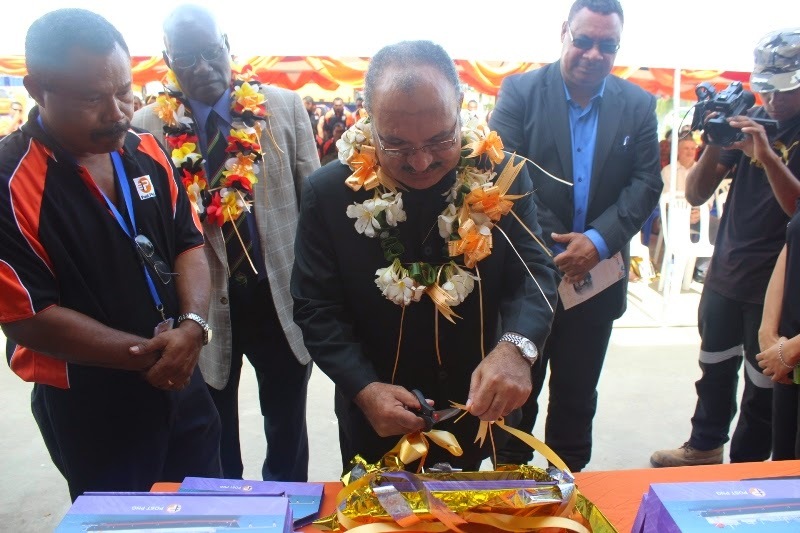 Prime Minister Peter O'Neill has called for Post PNG to continue to do their best to ensure Papua New Guineans in remote locations continue to have ongoing access to quality postal services. Speaking to workers and management at the Konedobu Post PNG facility yesterday, the Prime Minister officially launched three new Post PNG products and witnessed the first dividend cheque being paid by Post PNG in more than 26 years. PM O'Neill said postal services around the world are facing pressure as people turn to the Internet for sending correspondence, however, in Papua New Guinea the traditional letters and parcel service remains of vital importance and must be maintained. "As people now tend to send their mail through email and online services, the first business to suffer is the postal services," the Prime Minister said. 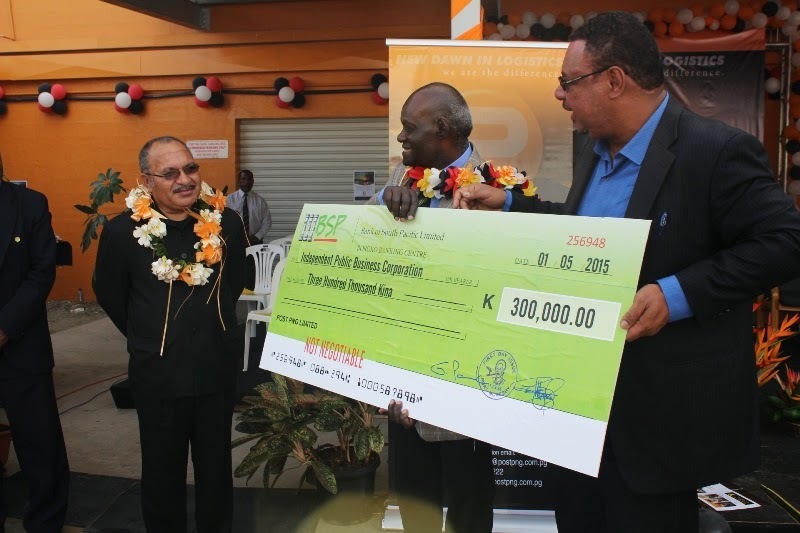 "We all know the challenges that Post PNG has been going through, both in terms of restructuring itself, and trying to establish its business under these challenging circumstances. It has not been easy. 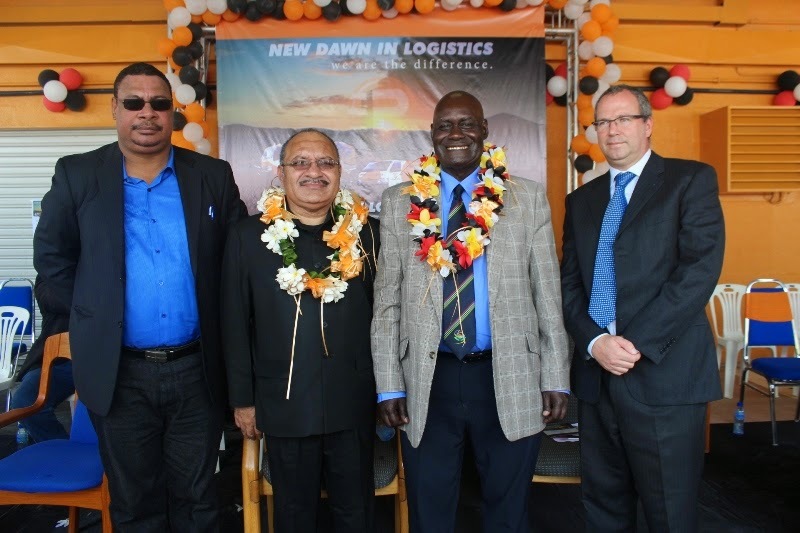 "As government, we have support PNG Post adapting into this new business environment. "This is why we placed additional capital into PNG Post, and as a result, can see that postal services and related businesses are starting to deliver better outcomes. "It is pleasing to note that Post PNG is turning the corner and improving the quality of services that it provides to the people of Papua New Guinea." The Prime Minister further asked Post PNG employees present at the ceremony to continue to work together in strengthening the level of service they provide to the people. "We are very proud of what you do. "I know it is not easy being in a business that is facing such challenges, but thanks to your efforts, all of you working together as a team, you are delivering new results for PNG Post." 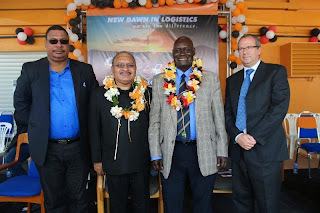 While at the Konedobu compound, the Prime Minister launched the business E-Commerce project, the 2014 Annual Stamp Album, opened an airfreighted bonded warehouse for storage of goods, and witnessed the presentation of the K300,000 dividend payment to the Independent Public Business Corporation (IPBC). Prime Minister Peter O'Neill has expressed his satisfaction at the ongoing success of the PNG LNG project on the anniversary of the beginning of LNG production in Papua New Guinea one year ago last week. He said the PNG LNG project is testament to the strong working relationships between key stakeholders that saw the project delivered on budget and ahead of time. "The PNG LNG Project has faced many challenges since its inception, but through determination and partnership the construction phase was completed and production began one year ago," O'Neill said. "We congratulate our partners, particularly ExxonMobil PNG Limited, for their tireless support for this project, and landowners in affected areas for actively engaging in this process and reaching agreement. "The production of LNG in Papua New Guinea is one of the most important developments in our history and the benefits will be felt for decades. "During the production phase more than 10,000 Papua New Guineans were employed and they expanded their own skills and capacity. "This project is also an example of the investment and business opportunity in Papua New Guinea today. "A number of other substantial projects are being developed around the nation, and as I stated yesterday during my visit to the Antelope Wellhead 5, we offer the same commitment and better as we engage with our stakeholders." The Prime Minister said that the first full year of production was an important milestone in the ongoing development of the nation. "2015 is a defining year for Papua New Guinea as our country moves on from the problems of the past to a future that is bright. "In our 40th year of independence we are seeing change and improvement in the delivery of services for our people. "We are building new classrooms and more children are going to school, we are making healthcare truly universal, improving law and order and building the infrastructure we need for a stable economy. "These key areas or economic activity have been made possible because of the approach our country now takes to economic management and business development. "The PNG LNG project is a very important part of the Papua New Guinea business success story." 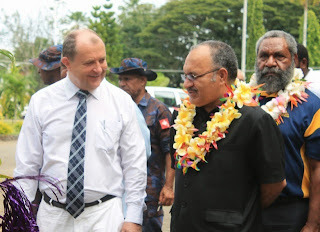 Prime Minister, Peter O'Neill, has welcomed the 10th Successor of Don Bosco, Rector Major, Fr Angel Fernandez Artime, SDB, and his delegation from Rome, to Papua New Guinea on Thursday. 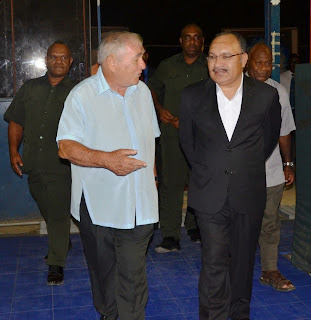 At a reception dinner held at the Don Bosco Technological Institute in Port Moresby on Thursday, PM O'Neill said on behalf of the Government and people of Papua New Guinea, "I warmly welcome Fr Angel Fernandez Artime and his delegation from Rome. "I would like to express our appreciation of the good work Don Bosco Technological Institute continues to do in our country," the Prime Minister said. "What the Churches are or have been doing for many years, illustrates the importance in guiding our men and women to improve their lives and careers." He acknowledged that Don Bosco had been at the forefront in providing skills and education to many of our citizens for many years. "Recently our government announced the Church-partnership program, which is providing many good opportunities in our communities. "Our government has also embarked on an education programme through free education, adding an additional one million children into schools throughout the country. "However, that would not have been achieved without the support of our church-funded institutions like Don Bosco, and we appreciate the support and the work that they continue to do." The Prime Minister said ongoing economic growth, the nation needed a more skilled workforce into the future that could ensure that growth continued. "Don Bosco's contribution to training our workforce and improving the capacity of our youth is immensely valued. "This is a partnership that we critically value – a partnership we want to continue to strengthen. "Therefore, I am giving you my absolute assurance and commitment, that this government will continue to support the good work that Don Bosco is doing under the Catholic denomination and further support other churches as well. The Rector Major and his delegation will be visiting Papua New Guinea and Solomon Islands from April 30 to May 5, to commemorate the Bicentenary (1815-2015) of Fr Don Bosco's birth. Prime Minister Peter O'Neill has called on individuals who might be tempted to be involved in drug crime to think twice or ruin the rest of their lives. O'Neill made the comments in response to media requests following recent drug crime stories in the national media. "In relation to recent arrests in Indonesia of Papua New Guineans on charges of drug possession, it would not be appropriate to comment as these matters are due to appear before the courts," the Prime Minister said. "Papua New Guinea is providing consular support to those who have been arrested and we will continue to monitor the situation." "In relation to the broader issue of drug smuggling, be this is Papua New Guinea, Indonesia, Australia or any other country, I have a simple message. Anyone considering transporting illegal drugs must be prepared for the consequences, and these consequences are serious. "In the ASEAN region in particular the penalties for drug smuggling are very strong, and everyone travelling to these countries knows what a serious crime it is to have or carry drugs. "The signs are posted at immigration entry points and information is read out on arriving flights. Travellers are warned that these countries have very strict drug laws, and drug trafficking carries a mandatory death penalty and this is also applied to foreigners. "Improvements in law enforcement around the region means that there is a much greater chance now that drug smugglers will be caught. "People who get involved in this illegal activity can expect to be arrested, convicted and given a serious sentence." The Prime Minister called for vigilance and awareness in families and communities to work together and with the Government to deal with drug problems. "Drug abuse is a dark cloud over society all around the world and every day countless numbers of people die and families are broken. "It takes a community effort from everyone to work together to try to prevent people from taking drugs, while at the same time finding and arresting those who are involved with drug crime."